Yes, your workplace is sexist. And this new Seattle podcast is here to help. A KUOW-sponsored podcast, "Battle Tactics for Your Sexist Workplace," is designed to help women navigate professional hurdles like unequal pay, manterrupting peers and how to get access to, and opportunities for, advancement. First of all, stop referring to Amazon’s Alexa as “she.” Alexa is not a woman. Alexa is a robot. That should nip whatever sexist bud may be growing on your kitchen counter. As for your workplace? It might help to start listening to the KUOW podcast “Battle Tactics for Your Sexist Workplace,” designed to help women navigate professional hurdles like unequal pay, manterrupting peers and how to get access to, and opportunities for, advancement. 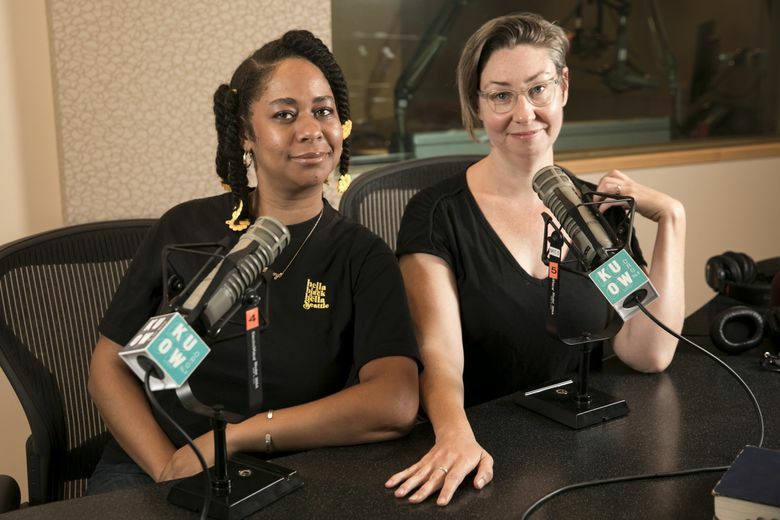 The podcast, hosted by KUOW special-projects editor Jeannie Yandel and contributor Eula Scott Bynoe (who also hosts a podcast called “Hella Black Hella Seattle”), is available on the station’s podcast page. In the past few months, Yandel and Scott have produced five episodes which have each been downloaded some 15,000 times. “Isn’t that crazy?” Yandel asked the other day. The idea came out of a 2016 conversation Yandel had with Seattle native Jessica Bennett, who had just written a book called “Feminist Fight Club” (and has since become the first gender editor at The New York Times). After an onstage talk about the book at Seattle’s Town Hall — and especially after the impassioned Q&A that followed — Yandel knew there was still a lot to say about sexism, whether it comes in the form of pay disparity, meeting culture … or things you can’t quite put your finger on. Some of those stories have belonged to KUOW’s own staffers. At one point during my visit, Yandel and Scott Bynoe led me to the station’s lower floor to show me a room where thick clusters of wires hung from the walls. It used to double as the station’s lactation room, until a female staffer spoke up and another space was found. Along with their smart and funny exchanges, Yandel and Scott Bynoe also do plenty of research. For example, women earn less for every dollar a man earns, and even less if they have children. (In one episode, they said a white cisgender woman makes 84 cents per a man’s dollar, 18 cents less for being a mother. A black woman makes 63 cents on the dollar, 9 cents less with a child; and Latinx, 54 cents.) It’s not only unfair, it also makes no sense: A McKinsey Global Institute report that found that more equal pay in the workforce would increase the gross domestic product of the global economy by 26 percent by 2025. So what kind of battle tactics do they offer up? Negotiating for pay (which women do less than 10 percent of the time, while men do it more than 50 percent) is most crucial when you’re first accepting a job. Do some research and ask a man working in that job what they’re making. If they’re uncomfortable, ask for a range. Does this sound low? High? About right? In negotiations, be willing to be uncomfortable in the moment and ask “Is this the best deal possible?” and then wait for a response. Upcoming topics have titles like “The Maternal Wall,” which will explore why it’s so hard to be a working mother; and “Office Housework,” about the jobs you do at your job that aren’t your job. Later on, they might take on things like ageism, or sexism on college campuses. Both Yandel and Scott Bynoe have learned a lot from their research, conversations and feedback from listeners. Scott Bynoe has become a better listener, and understands the importance of allyship. She has played a role in both putting other women down and raising them up. And she’s learned to take a closer look at some of the men in her life. “For so many of them, relationships are built around what they’re good at,” Scott Bynoe said, like being strong, or angry and not sensitive, which they are. And even though “it can be easy to point to the person in the White House,” Yandel said, there is not a “single villain” women can point to when it comes to sexism. Indeed, Scott Bynoe was only going to do the show if they were going to talk about solutions. She thinks “Battle Tactics” is doing that — and, in the process, slowly making room for men and women to take on other, bigger problems together.